Heat the oven to 400°F. Beat the egg yolks in a medium bowl with a fork or whisk. Unfold the pastry sheet on a lightly floured surface. Roll the pastry sheet into a 12-inch square. Cut off the corners to make a circle. Press the pastry into a 10-inch tart pan with a removable bottom. Trim the excess pastry. Prick the pastry thoroughly with a fork. Place a piece of aluminum foil onto the pastry. Add dried beans or pie weights. Bake for 20 minutes or until the pastry is golden brown. Remove the foil and beans. Let the pastry cool in the pan on a wire rack for 10 minutes. Heat the lemon juice and sugar in a 2-quart saucepan over medium heat to a boil. Remove the saucepan from the heat. Add the butter and stir until melted. Gradually stir half the lemon mixture into the egg yolks. Return the egg mixture to the saucepan. Cook and stir for 1 minute. Spread the chocolate on the pastry. Spoon the lemon mixture over the chocolate. Cover and refrigerate for 2 hours or until set. 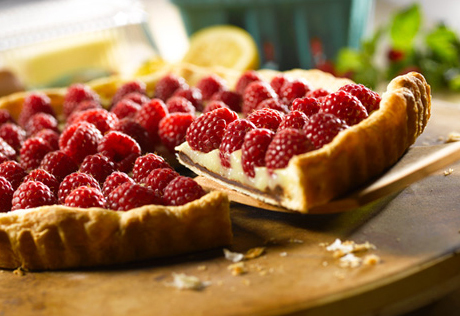 Arrange the raspberries on the tart. Garnish with the mint.